How has pesticide use changed over time? How can we measure water-quality and bathymetry? 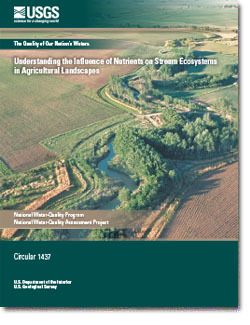 How do nutrients and pesticides get into our streams? Edge of Field Monitoring assesses the effects of best management practices (BMP's) on baseflow and storm runoff. How do nutrient loads in Ohio, Kentucky,& Indiana compare nationwide? Welcome to the Ohio-Kentucky-Indiana Water Science Center. In October 2017, the three Water Science Centers were merged to become one "Integrated" Science Center. 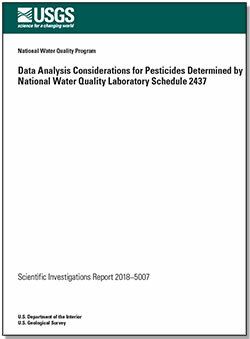 We look forward to helping you achieve your goals by providing water quantity and quality information, as well as scientific tools and understanding, when and where they are needed by citizens, businesses, and public officials. 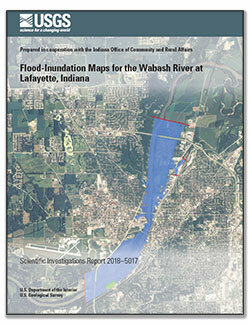 A Flood-Inundation Map is a visual tool that provides emergency management personnel and local residents with critical information for flood response activities such as evacuations, road closures, and post flood recovery efforts. Current Water Conditions Dashboard features real-time information for Groundwater, Surface Water, and Water-Quality sites for Ohio, Kentucky, and Indiana. This data was formerly known to most as the "Realtime Data" in table format. Although the format has not changed, we now refer to it as "Current Conditions".